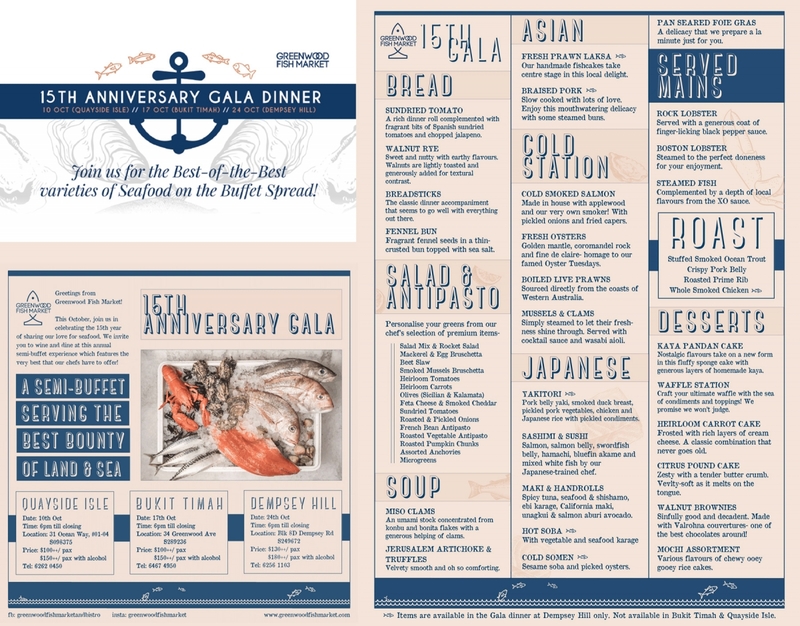 This October, Greenwood Fish Market celebrates their 15th anniversary with a series of gala dinners across its three outlets - Quayside Isle (10 Oct), Bukit Timah (17 Oct), and Dempsey Hill (24 Oct). We are giving away 3 pairs of passes (worth up to $260++ each) to three lucky readers! This decadent semi-buffet experience is a chance to savour the best and freshest bounty of land and sea that Greenwood Fish Market has to offer. Personalise your salad from the chef's selection of premium items including smoked mussels, heirloom carrots, and Sicilian and Kalamata olives. The Asian section will have Fresh Prawn Laksa and Braised Pork. There will also be a cold station serving smoked salmon, fresh oysters, live prawns, mussels and clams. For lovers of Japanese seafood, get ready to indulge in Yakitori, sashimi, sushi, handrolls, hot Soba and cold Somen. Moving on to the mains, delight in rock lobsters, Boston lobsters, and steamed fish complemented with XO sauce. End off on a sweet note with the desserts selection including Kaya Pandan Cake, Waffle Station, Walnut Brownies and more. 2. Tell us what your favourite seafood is and why you want to dine at Greenwood Fish Market and indicate your preferred location - Quayside Isle (10 Oct), Bukit Timah (17 Oct), and Dempsey Hill (24 Oct). 3. Don't forget to leave your name, mobile number, and email address so we can reach you! For more information regarding table bookings, cover charge and to get the latest updates regarding this event, visit the event Facebook page.